On the surface, Ha Seong-nan's stories seem pleasant enough, yet there's something disturbing just below the surface, ready to permanently disrupt the characters' lives. A woman meets her next-door neighbor and loans her a spatula, then starts suffering horrific gaps in her memory. A man, feeling jilted by an unrequited love, becomes obsessed with sorting through his neighbors' garbage in the belief that it will teach him how to better relate to people. A landlord decides to raise the rent, and his tenants hatch a plan to kill him at a team-building retreat. 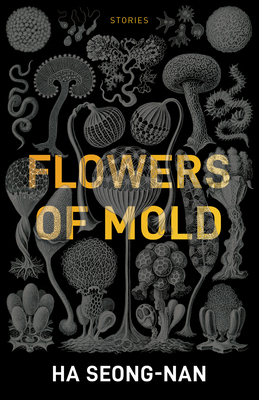 In ten captivating, unnerving stories, Flowers of Mold presents a range of ordinary individuals--male and female, young and old--who have found themselves left behind by an increasingly urbanized and fragmented world. The latest in the trend of brilliant female Korean authors to appear in English, Ha cuts like a surgeon, and even the most mundane objects become menacing and unfamiliar under her scalpel. Ha Seong-Nan was born in Seoul in 1967 and made her literary debut in 1996, after her graduation from the Seoul Institute of the Arts. She is the author of five short story collections--including Bluebeard's First Wife and The Woman Next Door--and three novels. Over her career, she's received a number of prestigious awards, such as the Dongin Literature Award in 1999, Hankook Ilbo Literature Prize in 2000, the Isu Literature Prize in 2004, the Oh Yeong-su Literary Award in 2008, and the Contemporary Literature (Hyundae Munhak) Award in 2009. Janet Hong is a writer and translator based in Vancouver, Canada. Her work has appeared in Brick: A Literary Journal, Lit Hub, Asia Literary Review, Words Without Borders, and the Korea Times. She has received PEN American Center's PEN/Heim Translation Fund, the Modern Korean Literature Translation Award, and grants from English PEN, LTI Korea, and the Daesan Foundation. Her translations include Han Yujoo's The Impossible Fairy Tale, Ancco's Bad Friends, and Ha Seong-nan's Flowers of Mold. She also translates works by Bae Suah and Kim Soom, among others.